Apple has finally released its another latest beta version of its upcoming iOS 6.1 Firmware for iPhone, iPad and iPod just before the expiration of its previous build of iOS 6.1 Beta 4 Firmware version, now iDevice users can Download iOS 6.1 Beta 5 IPSW Firmwares for iPhone 5, iPhone 4S, iPhone 3GS, iPad 4, iPad 3, iPad 2, iPad Mini, iPod 5G Touch and iPod 4G Touch devices which is officially available for iOS Developers and General Users worldwide from Apple. If any Apple's iPhone, iPad and iPod device user wants to download and install the latest iOS 6.1 Beta 5 Firmware through OTA (Over-the-Air) Automatic Wireless process, than they can do it by simply going to Settings > General > Software Update on any desired Apple device and iOS users and iOS developers can also Download iOS 6.1 Beta 5 IPSW Firmwares through iOS Dev Center Website and if anybody wants to Install iOS 6.1 Beta 5 Firmware Manually via iTunes than they can Download and Install iOS 6.1 Beta 5 IPSW Firmware via Direct Download Links available for iPhone 5, iPhone 4S, iPhone 3GS, iPad 4, iPad 3, iPad 2, iPad Mini, iPod 5G Touch and iPod 4G Touch devices below. Update: Download and Install Latest Apple's iOS 6.1 Final IPSW Firmwares for iPhone, iPad & iPod Touch Now. Many internet folks and experts are saying that iOS 6.1 Beta 5 Firmware is also a Golden Master (GM) Release of iOS 6.1 but Apple hasn't yet disclosed whether it’s a beta 5 release of iOS 6.1 or it’s a Golden Master (GM) Release of iOS 6.1, but we will let you know once it gets confirm from any authentic sources, but still iOS 6.1 Beta 5 is officially available for iPhone, iPad and iPod Touch. Download, Install and Update iOS 6.1 Beta 5 IPSW Firmwares for iPhone 5, iPhone 4S, iPhone 3GS, iPad 4, iPad 3, iPad 2, iPad Mini, iPod 5G Touch and iPod 4G Touch via Direct Download Links and also Unlock, Activate and Jailbreak iOS 6.1 Beta 5 Firmware On Pre-A5 Apple's iPhone 4, iPhone 3GS and iPod 4G Touch devices by Using RedSn0w v.0.9.15b3 Tool, now Jailbreaking of iOS 6.1 Beta 5 Firmware on iPhone, iPad and iPod Touch is also possible and available below. Update: Download and Install Latest Apple's iOS 6.1 Final IPSW Firmwares for iPhone, iPad & iPod Touch Now. 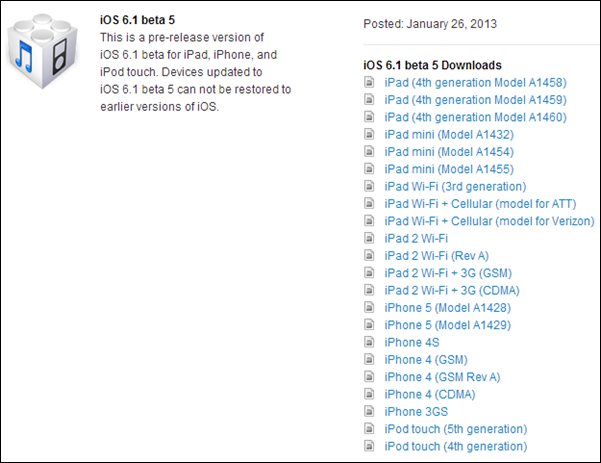 Apple users can download, install and update iOS 6.1 Beta 5 IPSW Firmware files from following official mirrors. How to Jailbreak and Activate iOS 6.1 Beta 5 Firmwares on iPhone, iPad and iPod Touch?